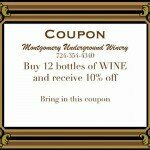 Click the image below and print the coupon to receive a 10% discount on the purchase of 12 bottles of our fine table wines at the Outlet Store or Winery. My wife & I really enjoy visiting the local wineries in PA. I am checking out your website and am surprised to that there is no listing of the wines you currently produce and sell. Would hate to make the trip to find out you only produce, say, reds, when we prefer whites. Can you forward a list? The information on the wines is now available in table form for viewing and printing here. You can sort by column and filter the list.